Description: This summer seasonal release is a twist on the summer saison. In addition to the infusion of apricots into a wheat and Pilsner malt base, it is fermented with wild strains of Lactobacillus yeast give it a tart, sour twist. Tasting Notes: Again, this beer made for a interesting combination. The wheat malts are gentle, the apricot provides a hint of sweetness, and the yeast gives it a touch of spice and a mild sour kick that compliments things nicely. It finishes a little on the light side, but still manages to make for a pretty tasty and refreshing brew. 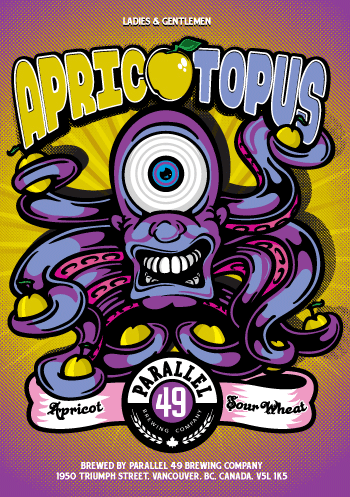 This entry was posted in BC Beer, Reviews and tagged Apricot Wheat Ale, BC beers, Lactobacillus yeast, P49 Apricot Opus, P49 Brewing, pilsner malt, saison ale, sour ale, vancouver breweries, wheat ale, wheat malt by storiesbywilliams. Bookmark the permalink.